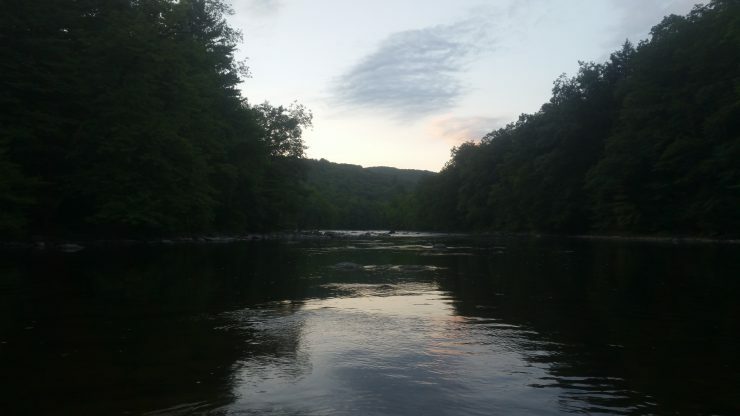 This weekend I had a chance to get out on the Housatonic River and chase smallmouth with members of Mianus TU. They’re a great bunch of folks and their events are always fun and well attended. Overall the fishing was good. I stuck to streamers, and brought fish to hand using an olive woolly bugger, as well as an Orange Blossom Special. 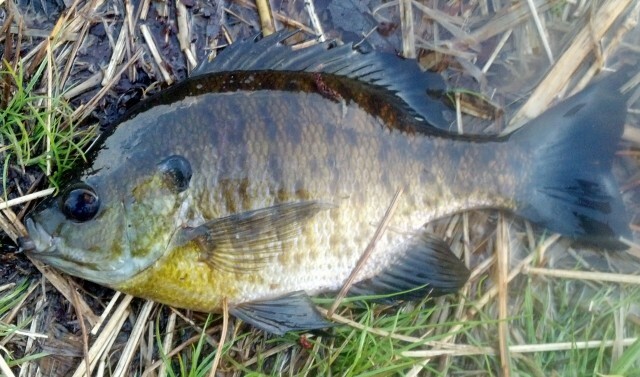 The fish held in deeper water where the current was strong. This time out I brought a 9′ 6 wt. and used 4 lb fluoro for a leader. The rod had some serious bends, and I’m happy to say the fluoro was tested but not broken. 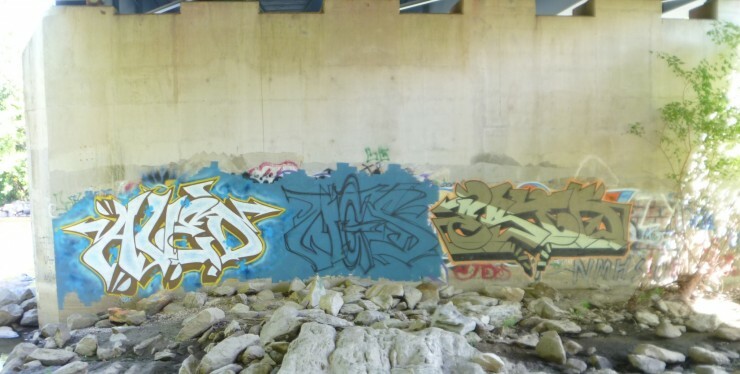 During my travels I came across this grafitti. I guess more than just anglers frequent these pools. Maybe next time they will add some fish art. This was an interesting building. 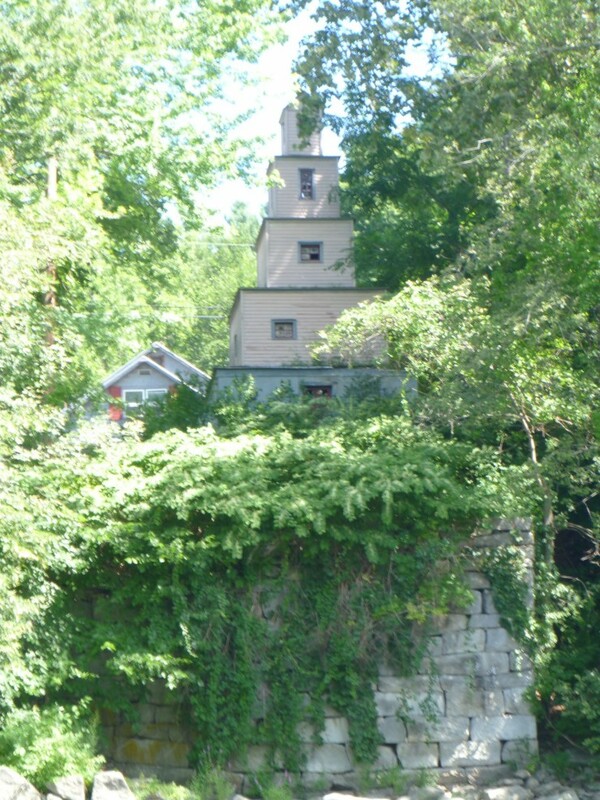 I’m not sure if it was used as a home or a workshop, but it has a great view of the river. We finished off the day by heading to the Old Heidelberg restaurant in Bethel. Good food and great company. Hope you’re able to spend some time on the water during these last few weeks of summer. Enjoy! Sometimes a change in plans turns out to be better than expected – Sometimes. 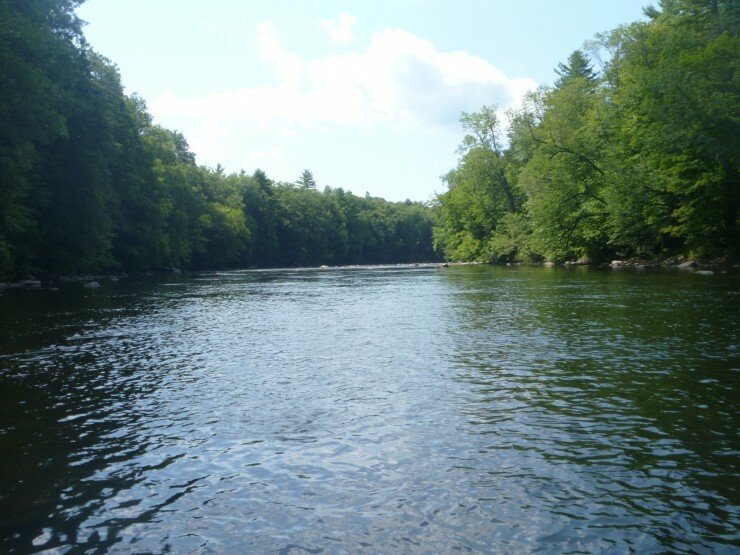 Today I headed out to the Housatonic River for what I thought was going to be a chance to chase trout with dry flies. I arrived to find the river clear and low, with better wading conditions than I usually experience. Best of all, I had the water to myself. The temperature was forecast to reach almost 90 degrees later in the day, so I knew this would be a morning session at best. The water was cool, which made it comfortable inside my waders, and let me know that I probably wouldn’t be stressing the fish either. I tied on one of the dries recommended on the local fly shop’s web site. Rises were only sporadic, but there were rising fish. After a half hour of casting with no takes, shakes or refusals, I decided to switch up my offering. Usually I go to a double nymph rig, but today I chose an olive woolly bugger. It was a bit heavy for my 9′ 4/5 wt., but I was mostly dead drifting in water that was 4 ft. deep with a reasonable current. Within minutes I had a fish on. But it wasn’t a trout. It was too wide and too green. I initially thought it might be a bream. But it didn’t fight like a bream. It fought like a trout. Or a bass. 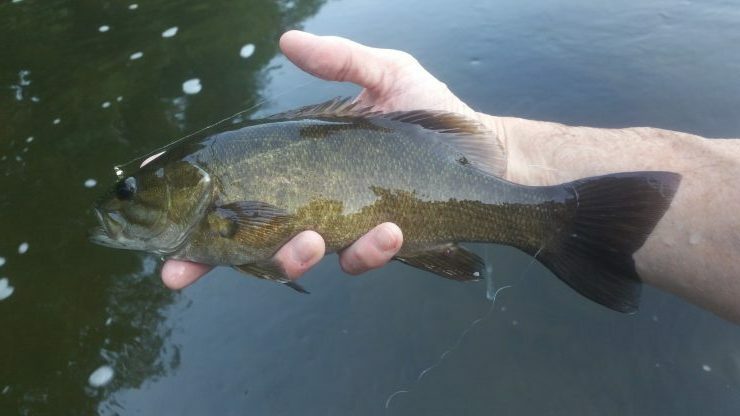 And so began an 4-hour stretch of catching smallmouth on streamers in the middle of the day in severe clear conditions. I stopped counting at a dozen, which coincidentally may have been when I started to feel some tightness in my arm from casting, fighting and stripping them in. None were trophy size, but they all put up a good fight, easily comparable to trout. All were caught on woolly buggers – mostly olive, but black worked as well. I did test dries, nymphs and wets without success. It was clear that streamers were on the menu. So has my trout spot disappeared entirely? Luckily the answer is No. 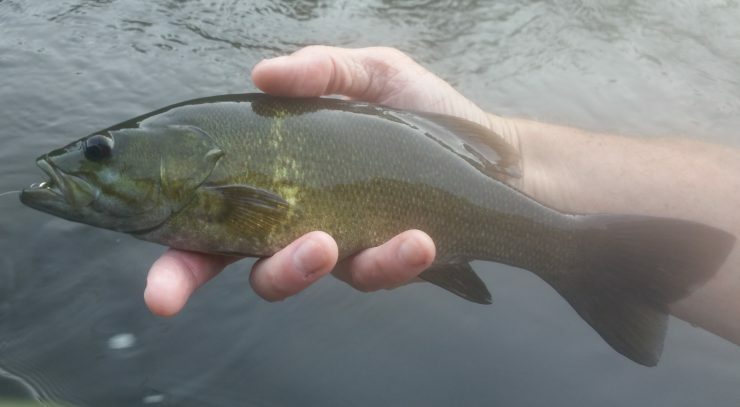 I did catch one 14″ brown on the olive woolly bugger. Much to my dismay, it broke off before I could get it into the net for a picture. To add insult to injury, or more accurately, injury to insult, I fell while returning the net to its holder. The water was only knee-deep, but it was enough to get inside my waders and drench me thoroughly. Any other time I would’ve complained and headed to the car for a change of clothes, but the cool water felt good on such a hot day. By the time I left the river, I had almost completely dried. While it didn’t go as originally planned, this truly turned out to be a great trip. 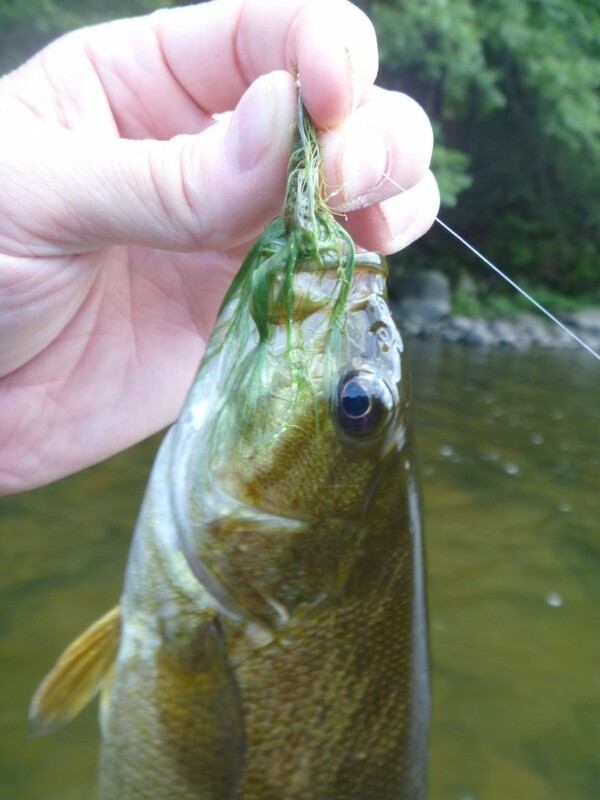 I learned more about catching smallmouth, and in the process, worked on my streamer technique. 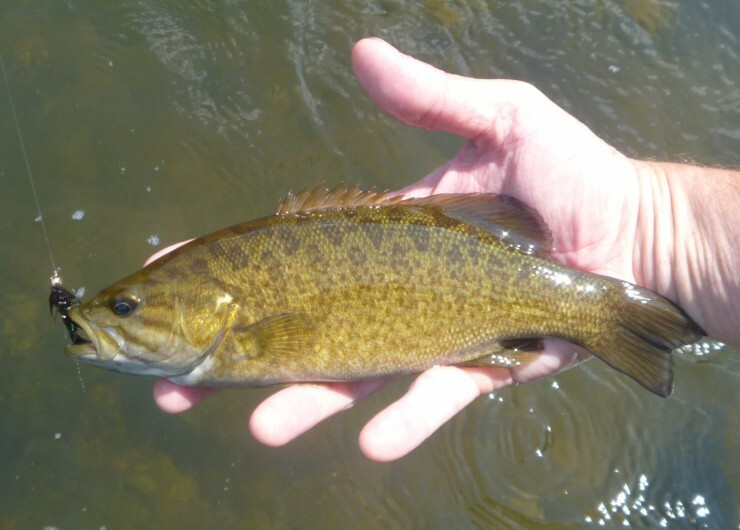 I don’t typically target smallies, and rarely use streamers, but this will change. 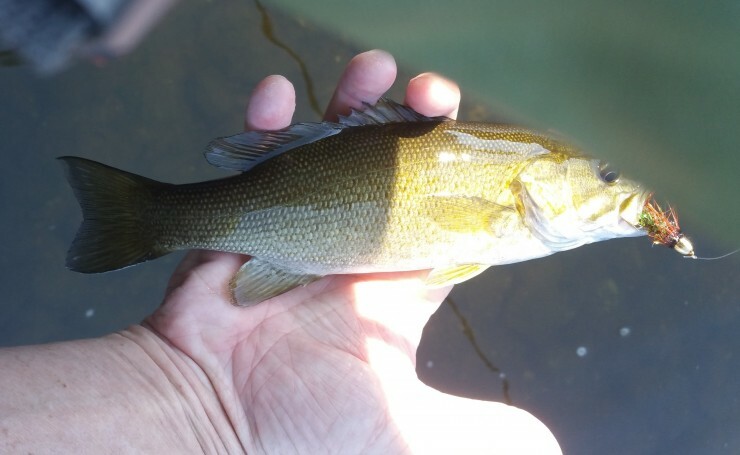 For juvenile smallmouth, my 4/5 wt. performed fine, although it was a little weak for tossing streamers. A 6 or 7 wt. 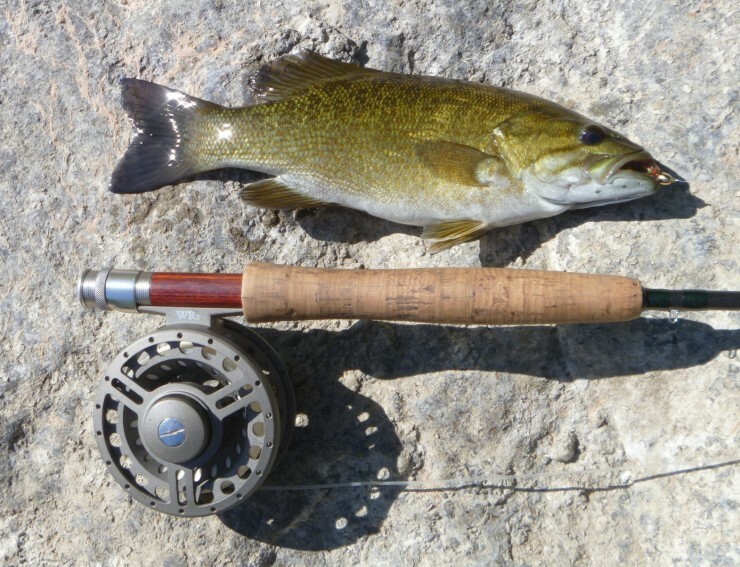 rod is probably a better choice, especially if the smallies are over a pound. Whether you’re going for trout, bass or something else entirely, remember the sun is at its hottest this time of year. Drink plenty of water and apply sunscreen frequently when you’re following fins. Enjoy! For most of us in New England, spring has been slow in coming this year. April continued to deliver snow and cold, and the heavy rains of the past two days have left us with with flooding, washed out roads and streams swollen with water that could be easily mistaken for chocolate milk. But May is already starting to show promise. This morning started off with rain and fog, but by the afternoon it was blue skies and temps in the 70’s. After work I fired up the grill for some steaks, and found that there was enough time after dinner to spend some time at the local pond. It was great to see these guys again. 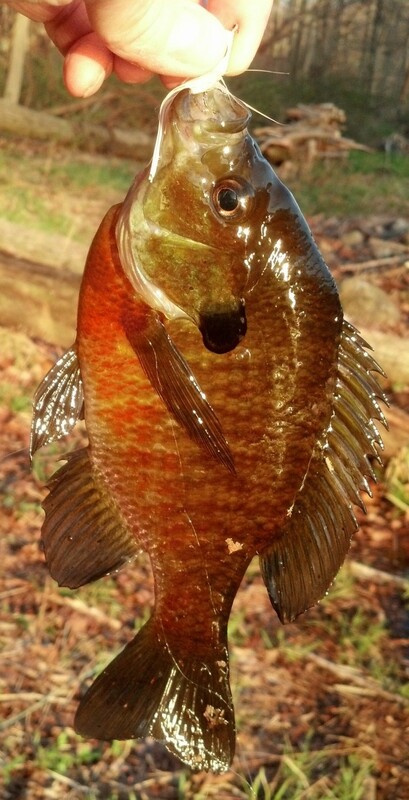 Their colors seemed to have deepened over the winter, and they were eager to take anything from a popper to a wooly bugger. 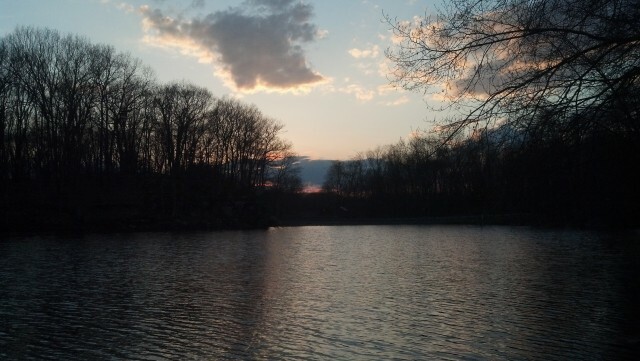 Best of all, as the sun set the temps did not drop dramatically, making it a comfortable walk back to the car. Hope you’re getting out for some early spring action. Enjoy! 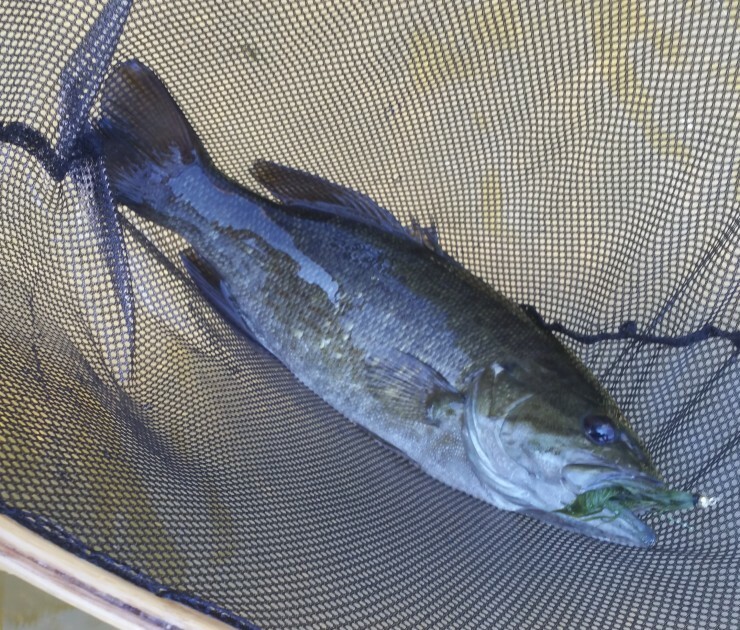 Take kayak and 4wt fly rod to local lake designated as trout park. Fish the entire perimeter of the lake. Catch plenty of bream but do not hook or spot any trout. Begin speaking with local spin fishermen who mention that hundreds of trout have been dumped right by the boat launch, less than 50 feet from where you’re standing. Stow kayak and tie on olive wooly bugger. Begin fishing next to boat launch. 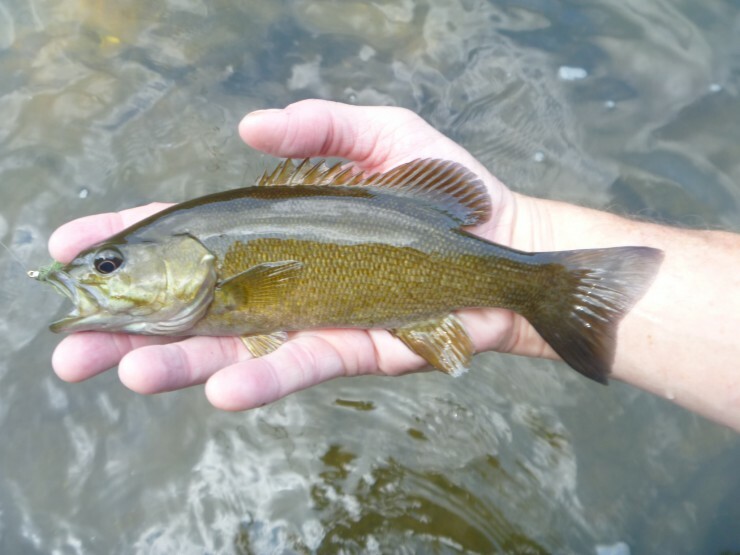 Proceed to catch three nice 14″ browns while your new spin fishing buddies catch nothing. They commend you, but refer to your fish as small. They also begin to whisper between themselves. Leave camera and phone in the car so there is no proof of the fish caught. After the 3rd fish, your new friends kindly suggest that you leave. Thank them and take their advice. Walk backwards to the car. Hastily stow gear and jump in the driver’s seat. Drive off slowly. Wave to new friends on departure. Return to lake with flies, streamers and fly rod used for distance casting. Spend almost 3 hours pitching at the water. Produce only a few tugs and nothing brought to hand. Spin casters look on in disbelief or amusement. Do not verify which. Try every streamer and dry fly you own with no luck. Watch fish continue to rise all around you. Break down rod and begin trek back to car. To save face, approach spin caster and share with him how well you did yesterday. Tell him that you know what they’re biting on, but you don’t have anything that small in your box. Quickly walk away, stow gear and drive off.